Being more involved with my blog last year, made me really appreciate the look at social media in Just for Clicks. It sheds light on both the positives of influence culture, the behind the scenes, and the dangers. Twin sisters Claire & Poppy are accidental social media stars thanks to Mom going viral when they were babies. Now, as teens, they’re expected to contribute by building their own brand. Attending a NY fashion week and receiving fan mail is a blast. Fending off internet trolls and would-be kidnappers? Not so much. Poppy embraces it. Claire hates it. Will anybody accept her as “just Claire”? And what should Claire do about Mom’s old journals? The handwritten entries definitely don’t sound like Mom’s perfect blog persona. Worse, one of them divulges a secret that leaves Claire wondering what else in her life might be nothing but a sham. 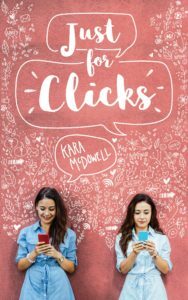 Just for Clicks was a fascinating look into the effects of social media, what binds families together, and the quest for self-discovery. It feels like Claire’s whole life is planned out, whether that be her sponsored outfit posts, her mother’s schedule for her day, or her and twin sister Poppy’s plans for the future. But as Claire begins to find out more secrets about her mother’s past, Claire realizes that she might have more say in her life than she thinks. But what will that mean for her family? Being someone who puts a lot of their life on social media, I appreciated the ways McDowell doesn’t stray away from the dangers and negatives about social media. It’s not all free advance read copies, there’s the stress, always being ‘on’, not to mention the dangers. As Claire begins to find out more about her mother’s past, she also begins to discover herself, and what she really wants. So one of the most important plots is Claire’s self-discovery and her ability to start standing up for herself. She struggles with guilt, responsibility, and love as they are all tangled up in family. How can she disappoint her sister? Will her mother still care about her if she doesn’t participate? Later in the book, these challenges are only further developed and heightened as the plot takes a shocking twist. But Claire really has to start differentiating herself, finding out if she truly wants to do something. What makes Claire so empathetic, despite her geeky personality, is how she feels like an outsider in her family. Not only does her mom make comments to Claire about her weight, Poppy and her mother naturally like their lifestyle. Poppy exudes confidence and the online trolls don’t get her down. And so Claire’s journey in this book is realizing exactly what point she stopped wanting the influence, or the fame, and what she should do about it. If she quits, does she also lose her family? Claire faces not only extreme pressure to always look good (even when it’s too hot to be wearing trench coats), but also online trolls. A large part of the story towards the end is about the bullying Claire and Poppy receive due to their fame. It incites fear and danger into their lives to know that people are so close to them. This is only exasperated by the kidnapping attempt. I appreciated how McDowell doesn’t gloss over social media and influencer culture. And how McDowell subtly illustrates it, whether it be through the emails their mom sends, or the emails they get from trolls, or even just brand offers. So much more happens in the book as we find out the secrets in Claire’s family, but it would spoil the book for me to reveal them. I wish there had been more depth to some of the issues brought up in the book – family, the ending as a whole, and the relationship between Poppy and Claire, but the book was really enjoyable. Claire was a character I could root for and the plot always kept me guessing even till the end. Find Just for Clicks on Goodreads, Amazon, Indiebound & The Book Depository. What other books do you know of that tackle social media?